Engineering is music to her ears. How do you know if a concert venue is going to make an evening of music amazing or just OK? You ask an engineer. 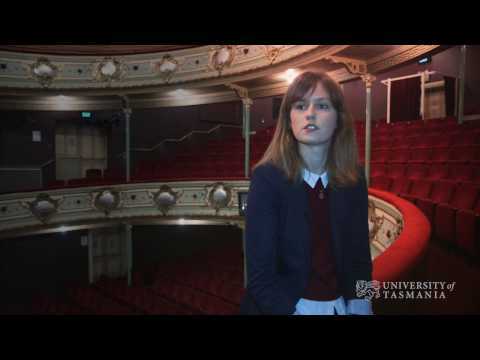 Specifically, an acoustician, like University of Tasmania Engineering PhD student Lily Panton. Lily studies the acoustics of concert halls, and she has examined virtually all of the major concert halls in Australia, including the iconic Sydney Opera House. “We use a loud speaker and we emit an impulse, and then we measure that response somewhere else in the concert hall. From this we create a whole lot of parameters to identify whether that concert hall is going to be really good or really bad,” she said. Traditionally this process has been used to design the space for the audience, but Lily’s research is looking at how those measurements can be done on stage to design the orchestra shell for the musicians. At school, Lily was good at maths and science, but she didn’t know what to do with her skills. She chose engineering at UTAS because she didn’t have to choose a specialisation right away. She went on to focus on civil engineering, completing an Honours year and now a PhD. It was in her Honours year that Lily uncovered this interesting field of study. She did a project in concert hall acoustics and she was hooked. Students also do 12 weeks of industry placement. “We also do lots of practical laboratories and field trips. Then for the Honours project, most have an industry link or real-world link, so you have to go out into the field to do that project. When you study Engineering, it’s pretty easy to branch out into a whole range of different things, she said. Is this music to your ears? Apply now to study Engineering. With an Engineering degree from UTAS, it really is a case of ‘choose your own adventure.’ A perfect example is Lily Panton. Are Capital Gains Tax Rate Preferences a Necessary Feature of CGT? The appropriate taxation treatment of capital gains is one of the most controversial issues in tax policy. The University of Tasmania’s research community is celebrating its achievements following the release of the Excellence in Research for Australia (ERA) 2018 outcomes, and Engagement and Impact (EI) assessment. As the only university to operate a continental array of radio telescopes, the University of Tasmania plays a key role in the global space industry. And soon there could be a working lab on smartphones.